The satisfying smack of palm against palm. The universal sign of “way-to-go.” Really, who doesn’t love a good high five? This was my mindset when I created my positive reinforcement system. I used to always go around high-fiving students for awesome things in the classroom: good discussion contributions, A+ on tests, enthusiastic attitudes, getting rid of spiders… I decided to translate this into something tangible that the students could bring home to get their parents involved. I created a set of High-Five slips with clever memes depicting everything from a grizzly bear high-fiving a shark to Dora the Explorer. 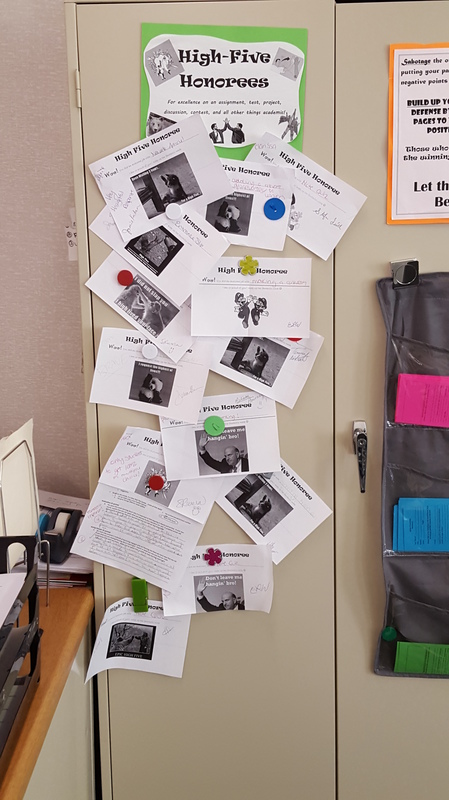 I also created a station to display all of the High-Fives earned by my students each quarter. This part is key – having a visual reminder of positive classroom behaviors helps motivate students. At the beginning of the school year I explain to my students the concept. For anything I see that I deem going above and beyond, I will award students a High Five. I stress that this can go beyond simple academic successes. For example, the other day I had a student connect a new vocabulary word to a short story we had read a month earlier and I awarded her a high five for making a connection in her education. 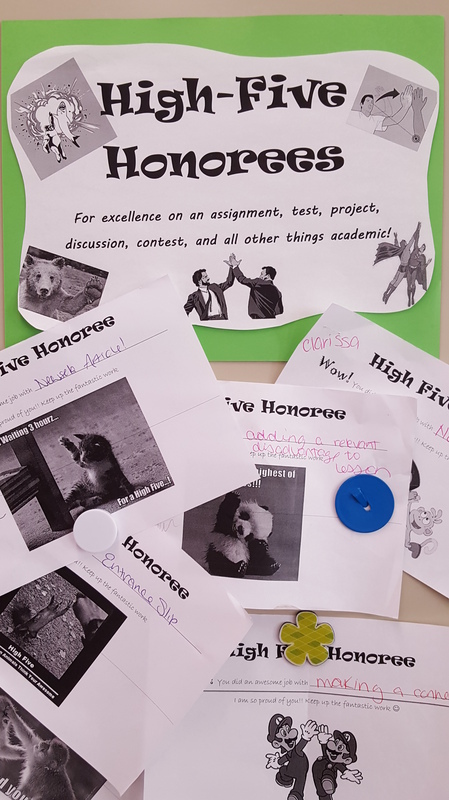 Next, I explain to students that they need to bring the High Five home and brag to their parents about how awesome they are, get their parents to sign it, and then bring it back into the classroom. When they bring it back signed, they hang it on the board and earn a piece of candy. Like I said earlier, having a visual display helps keep students motivated. Also, I try to make a show of awarding high-fives. I will stop a discussion to grab one from my desk, causing students to start whispering that “so-and-so just earned a High Five!” When I hand them out, I always write the student’s name on the high five so I can keep track of who earned it. I also like to write personal messages, besides just listing what they earned it for. My favorite part of this system is the connection to home. I have parents who write back besides a simple signature – some add smiley faces or congratulations messages of their own. I have tried numerous other things, from tickets to check-marks to online systems. However, this has been the most successful in my classroom. 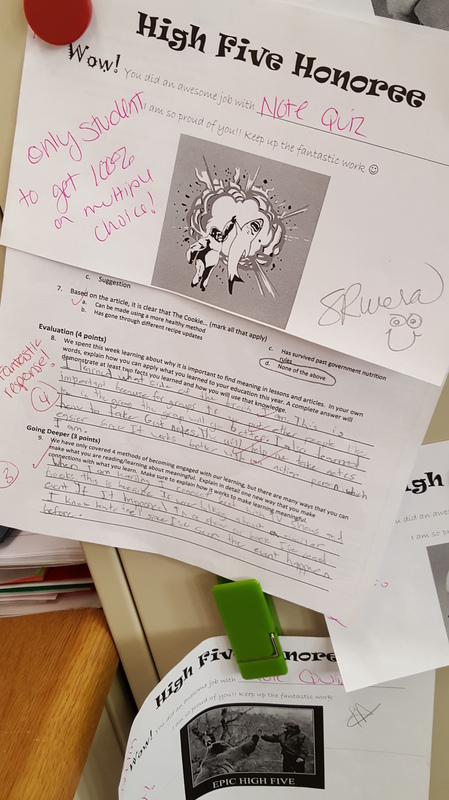 The students respond positively to it, the parents love seeing the acknowledgment of their child’s success, and it requires very little outside work on my end! What do you do to for positive reinforcement?